Friday night's dinner of pochachoes was so terribly low-brow that I wasn't even going to post about it. Of course I took pictures of it, but then felt that no-one would possibly be interested and decided not to blog it. But after I mentioned it in my previous post, and on Facebook, people kept asking me, "What are pochachoes?" So here goes. Let's just not tell the cool kids, ok? 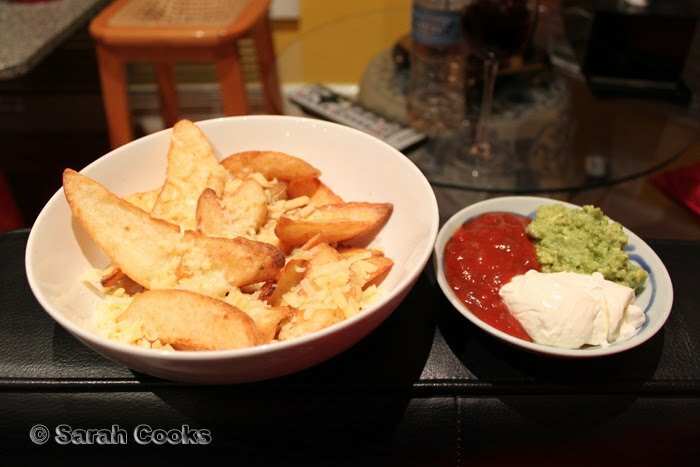 Pochachoes = NACHOES + but with POTATO WEDGES instead of corn chips. I got the idea when Sandra & I went for dinner at Taco Bill a couple of months ago, (again, let's not tell the cool kids! ), and I saw "Pochachoes" on the menu. I was most intrigued, but it seemed just a bit too heavy as a starter, especially with enchiladas to follow! Finally on Friday night I satisfied my pochacho curiosity. 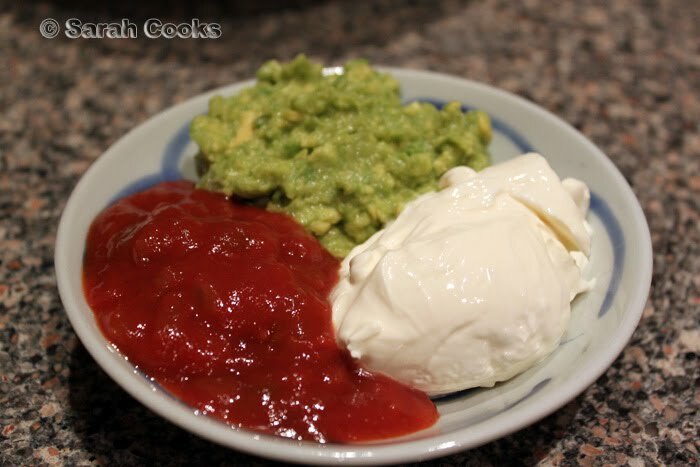 And on the side... sour cream, hot salsa and 1/2 a muushed up avocado. It was really, really delicious. Pocha....choes! You are correct this isn't a flashy dish. However I am sure it tastes great. We all need little gems like this in our cooking repertoire for nights in front of the TV with a DVD on. something that I need now. lazy couch tele day. Brilliant! And I may be in the minority, but sometimes I think I love seeing "low-brow" dishes on blogs more than the epic, awe-inspiring dishes. Oh they have a name!! 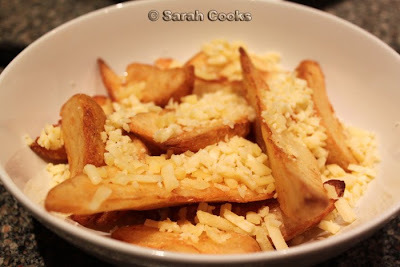 We make these sometimes when we seriously can't be bothered and wanting something tasty. oh GENIUS idea!! anything mexican is a winner for me!